The CEA ​is responsible for research and innovation programmes in two key areas: supporting the French nuclear industry, and developing the future nuclear systems called Generation IV. The CEA is also still investigating thermonuclear fusion, in particular via the international project called ITER which involves building the first prototype in the next decade designed to demonstrate the scientific and technical feasibility of this source of energy. Thanks to its long-standing activities in the nuclear field, the CEA has also built up expertise in nuclear radiobiology and toxicology. Such knowledge means that the CEA has the resources to accurately investigate the impact of nuclear activities on mankind and the environment. The CEA devotes a great deal of energy to research programmes to meet the needs of its industrial partners. This research focuses on reactors in the French fleet and covers issues such as service life, performance, availability and nuclear safety. Optimising the fuel cycle facilities is also an area of concern. The CEA is responsible on behalf of France for leading research on innovative nuclear systems - called Generation IV - which integrate major technological breakthroughs compared with the previous generation of reactors. It is mainly focusing its attention on sodium-cooled fast reactors (SFR), and on gas-cooled fast reactors (GFR) to a lesser extent. The CEA is the contracting authority of the Astrid project - an Advanced Sodium Technological Reactor for Industrial Demonstration - currently in its conceptual design phase. France chose to follow a policy wherein spent fuel is reprocessed and recycled. This strategy will reach its full potential with the fourth generation of reactors. Having developed the majority of the processes currently used by Areva at La Hague plant, the CEA is still continuing its research to improve, expand and adapt the technologies so it can rise to future challenges. It is therefore preparing the future nuclear fuel cycles in line with the development of Generation IV nuclear systems. The CEA is strongly committed to ensuring the highest levels of nuclear safety, whether as an operator of nuclear facilities or as a research organisation. The studies it leads in the field are not only supported by IRSN, but also French (EDF, Areva) and foreign nuclear operators. These studies fall within a long-term approach of continuous progress. High temperatures, irradiation, mechanical stresses, and corrosive environments: the materials used in nuclear power plants are subjected to extreme conditions. Guaranteeing the nuclear safety, service life and performance levels of current reactors, while designing and qualifying materials capable of resisting the specific constraints of future nuclear systems, are the main issues investigated at the CEA in the field of nuclear materials. The Jules Horowitz reactor (JHR) project led by the CEA will provide the means needed to explore an essential scientific and technical field: testing the behaviour of materials and fuels under irradiation in order to support current and future nuclear reactors. The JHR is currently under construction at the CEA Cadarache site. Once commissioned, this unique experimental irradiation tool in Europe will not only be available to the nuclear industry and research organisations, but also to nuclear safety authorities and their support units. It will also be used to produce radioelements needed in both nuclear medicine and the non-nuclear industry. As a nuclear operator, the CEA is responsible for dismantling its nuclear facilities and managing the waste resulting from such activities. It is also a key player in research on techniques and technologies used in such dismantling operations.  The management of radioactive waste in France is covered under the Act dated 28 June 2006. The CEA is involved on two fronts: as a nuclear operator, it is responsible for managing the waste it generates, and as an R&D player, it leads research on the treatment, conditioning and long-term behaviour of waste. The CEA is one of the leading European research organisations in magnetic confinement fusion. It actively contributes to the international roadmap for research in this field. The international project called ITER is at the centre of this research, which brings together the European Union, Russia, the US, Japan, China, South Korea and India. Under construction at Cadarache, this tokamak is designed to demonstrate the feasibility of using thermonuclear fusion to generate power. Thanks to its long-standing activities in the nuclear field, the CEA has built up expertise in nuclear radiobiology and toxicology. Such knowledge means that the CEA has the resources to accurately investigate the impact of nuclear activities on mankind and the environment. ​How do we guarantee energy independence and secure supplies, while improving safety standards, optimising our management of materials, and minimising waste production? And all this without emitting greenhouse gases? These are the specifications for future nuclear systems defined by the Generation IV International Forum (GIF). The CEA’s Nuclear Energy Division is developing innovative solutions in the field of nuclear dismantling which are already the subject of industrial transfers. ​​​Though it is a well-defined industrial product that has been duly tested over several decades, nuclear fuel nonetheless remains the focus of numerous innovations. Learn about the main european bodies and infrastructures to which the CEA contributes in the field of nuclear energy. The IRFM is located in the CEA Cadarache Centre, in the south of France. The institute works on a new source of energy: the magnetic confinement fusion.